FOLLOWING PREVIOUS family summer musicals like Seussical, The Sound of Music, and Peter Pan, Brian and Seán Power’s Twin Productions is continuing this tradition at the Town Hall Theatre with Disney's Aladdin jr - The Musical, based on the hit movie and Broadway smash. With wonderful characters such as Aladdin, Genie, Jasmine, the Sultan, and Jafar, this is going to be a fun family show. Disney's Aladdin is not just famous for its story, but also for its songs - written by Oscar and Tony award winners Tim Rice, Howard Ashman, and Alan Menken - like ‘Prince Ali’, ‘A Whole New World’, ‘Friend Like Me’, and ‘One Jump Ahead’. This production also boasts a stunning set designed by Scenic Projects London so fans of the original film will feel right at home. Disney's Aladdin Jr takes audiences to the city of Agrabah where we meet the Sultan and the Princess Jasmine. Among the stalls in the market place, Aladdin is accused of stealing food, which puts him at odds with the local law enforcement. He is captured by the evil sorcerer Jafar and taken away by his chief guard Razoul, who throws him into a secret cave. Upon finding a magic lamp Aladdin discovers the Genie, who grants him three wishes. As the story progresses Aladdin plans to turn the tide on Jafar, hoping to save Agrabah and win the heart of Princess Jasmine. 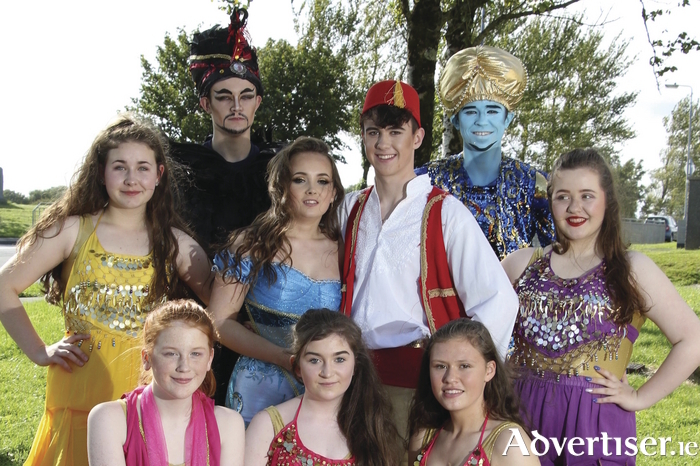 Twin Productions’ staging of Aladdin jr sees Niall Caulfield and Emily Macken take on the central roles of Aladdin and Princess Jasmine and they spoke with me about the show ahead of its Town Hall run. Niall’s co-star Emily Macken has been with Power Performance Academy for several years and has studied ballet and modern dance with Corrib Dance Academy. She has performed with Renmore Pantomime Society, Galway Musical Society in the Irish première of A Tale of Two Cities; with Twin Productions, and Claregalway Musical Society. Emily was a featured vocalist on the biggest selling Irish charity single in chart history, 'Tiny Dancer' by A Song for Lily-Mae. Emily has also performed on the stage of the Bord Gáis Energy Theatre and appeared on The Late Late Show. “I first went onstage when I was four but this is my first leading role so I am very excited about that,” she tells me, before describing the character of Princess Jasmine: “She is really stubborn and sarcastic and likes to get her own way and doesn’t take no for an answer - so it is easy to relate to her," she adds with a laugh. Disney's Aladdin jr - The Musical is directed by Seán Power; the choreographer is Declan J Gardiner; chorus director is Megan Lohan and musical director is John O’Dea. The show runs at the Town Hall from Thursday August 24 to Sunday 27. Thursday and Friday performances are at 7.30pm, Saturday and Sunday sees two shows each day, at 2.30pm and 5pm. Tickets are €17/15 from 091 - 569777 or www.tht.ie Book your seats for a fun-filled flying carpet ride full of romance and adventure!